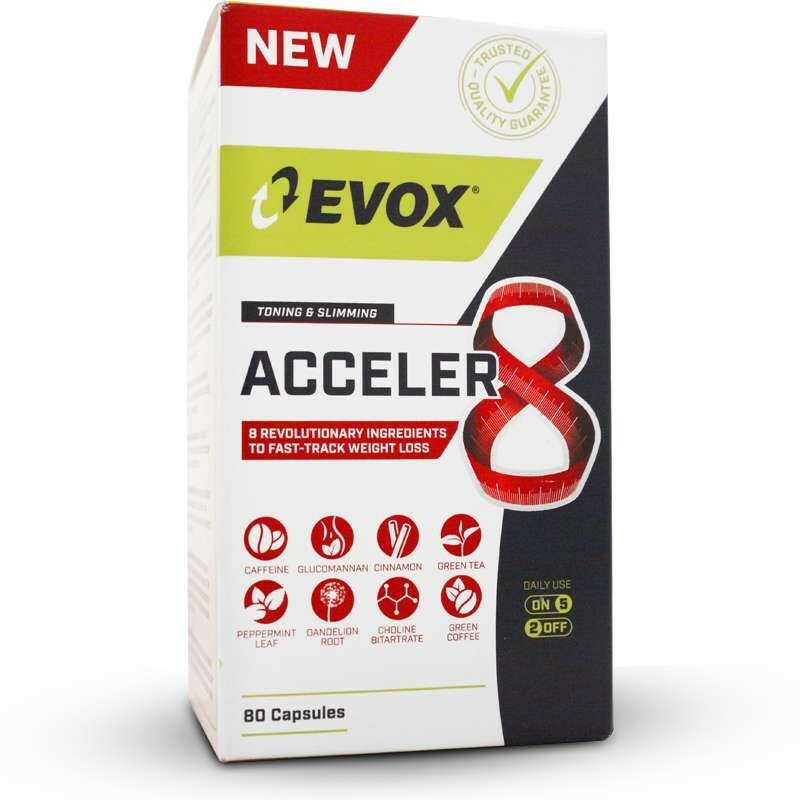 EVOX Acceler 8 is formulated with 8 unique herbal ingredients that aid in fast-tracking weight control. Fitness athletes reduce their calorie intake when on a fat loss program. The reduced calories may result in decreased energy levels. Each serving of Acceler 8 has 140 mg of caffeine to give you more energy during the day. Reducing calories from food may also decrease mental focus and concentration. Caffeine has also been shown to improve mental alertness. Improved mental focus allows you to perform at your best during your gym workouts to maximise the results from each session. The water-soluble plant fibre Glucomannan has been added to give a feeling of fullness and satiety. A 5 week study of 176 healthy overweight adults showed Glucomannan to support weight loss. Dandelion Root has been used for many years to aid in the reduction of excessive water retention and removal of metabolic waste. EVOX have added Cinnamon Extract which has been shown in studies to reduce blood glucose levels and assisting in insulin functioning. Reviewing the ingredients of EVOX Acceler 8, this is one of the most innovative and unique weight control formulas currently on the market. In addition to being a quality product it offers great value for money for fitness athletes on a budget. May contain traces of crustaceans, peanuts or tree nuts. • For the first week, take 1 capsule 30 minutes before your breakfast meal and a second serving 30 minutes before your lunch meal. • After the first week take 2 capsules 30 minutes before your breakfast meal and a second serving 30 minutes before your lunch meal. • Not recommended for consumption after 4pm. • Take for 5 consecutive days of the week and stop use for 2 days before continuing again. Seek advice from your primary healthcare professional prior to use, especially if you have a known medical condition. This pill has helped suppress my appetite so much and I’m eating much less food and much healthier because the cravings aren’t there. I lost 2.6 kilos in the first week (I gym 5 times a week as well but I feel like everyone should. You can’t expect a pill to do everything for you). I’m 5’7 and now weigh 65kgs. I’m on week two and have my next weigh in Friday but my stomach is flatter and I feel lighter. My dad has lost 1.5 with absolutely no exercise.